A global publication for the scholarly publishing community, read by publishers, librarians, information professionals, academic authors and researchers. The ever-shifting sands of scholarly publishing – that is the process by which academic research is submitted, reviewed, published and accessed – provides a rich source of informed opinion and highly-sought after content within the pages of Research Information. 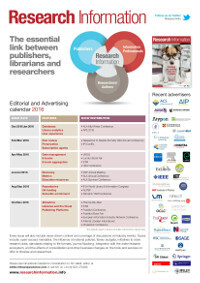 Publishers will learn how to enhance their offerings via case studies on the latest publishing platforms or discovery tools; information professionals can hear about the latest methods employed by subscription agents and library management service providers; and authors and researchers can follow the latest trends in topics such as open access and user experience. 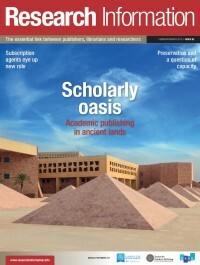 Attracting an ever-growing audience – both on- and offline – Research Information has grown into a ‘must-have’ resource for anyone involved in scholarly publishing, and therefore provides a perfect marketing platform for publishing service providers, publishers, library service suppliers, subscription agents and more. Research Information partners with major global events and organisations, such as the Frankfurt Book Fair, the London Book Fair, UK Serials Group (UKSG), the Society for Scholarly Publishing (SSP) and many more. Research Information is published six times a year, and is available free of charge to qualifying individuals in both print and digital format. Marketing options include display advertising, outserts, and inserts, as well as enhancements to the digital version, such as video overlay. As well as showcasing all the magazine content, www.researchinformation.info features pages of web-exclusive news, products, viewpoints, analysis and opinion, interviews, event previews and webcasts. Alongside traditional banner advertising, marketing options include sponsored content, as well as lead generation options through ‘Viewpoint’ and webcasts. There is a regular email newsletter: RINewsline, a monthly round-up of the latest news, event previews and more; and occasional show preview emails for major events. Marketing options include banner advertising, sponsored content, and product showcases.